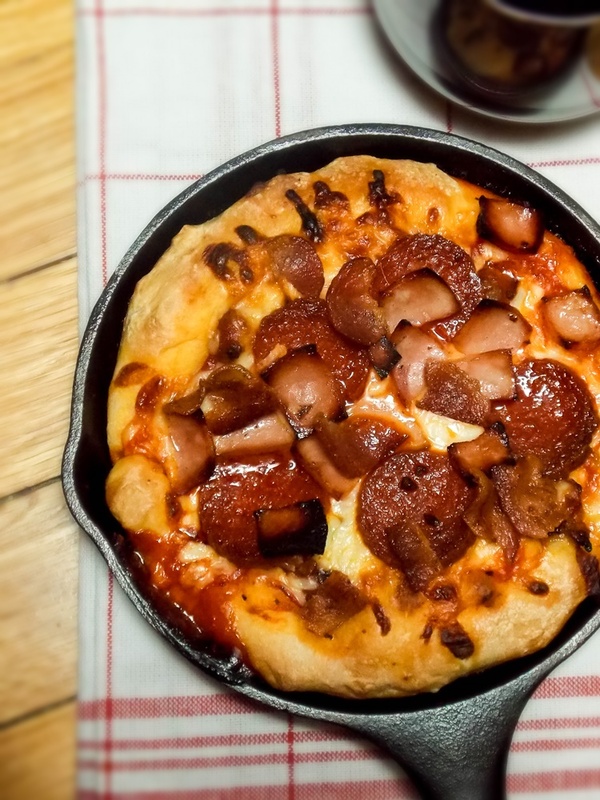 Meat Lovers Skillet Pizza for the meat lover in your life! 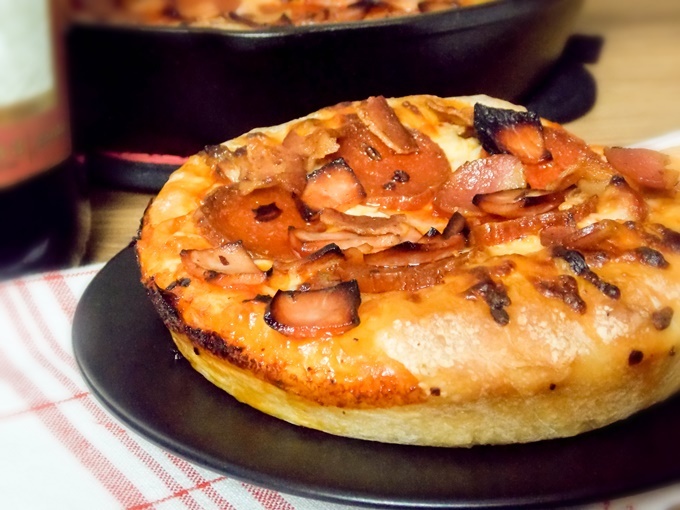 A pizza topped with all your favorite meats, sauce and hot, stringy cheese then baked in your cast iron skillet making the crust crispy on the outside yet still soft and doughy on the inside! This is everything the meat loving man in your life is going to love about this pizza! Do you know that October is National Pizza Month? I’m here today to celebrate this event with you along with the Sunday Supper Movement and Gallo Family Vineyards! I don’t know about you, but my grumpy hubby loves a meaty, doughy pizza whereas I will eat just about any kind of pizza! Thick and doughy crust or thin and crispy. I’ll take it! However, since I’m all about pleasing the man who has been in my life the last 15 years, I am willing to put up with his likes more so than mine for the most part. That could be what keeps our relationship going, however, he doesn’t ever make me go without so don’t think he doesn’t reciprocate! When I am making pizza, if Grumpy finds out it is anything other than a “traditional for Grumpy” type, then I get the pout. He also pouts if I don’t make it deep dish, which is why you see several recipes on my blog for deep dish pizza! How many of you can resist the pout that makes your heart melt and makes you give the object of your affection what he or she wants! If you can do that, please let me know how, because I’m older than the hills now and I still can’t do it! We love pan pizza and this Deep Dish Chicago Style Pizza has been our favorite for several years. I found that making the pizza in my glass Pyrex baking dish made a spectacular crust. However, my good friend Marion from over at Life Tastes Good has been producing some amazing Cast Iron Skillet Recipes and because of her I broke down and bought myself two Cast Iron Skillets! I have discovered that everything made in that skillet tastes better and am about to ready to go out and buy a collection of cast iron cooking dishes and toss away all the others! For our Friday night “sit back and relax, recuperate from a full week of work and late nights” time I decided to use a pre-made pizza dough from the local Italian bakery here in town. Most of the time I prefer to make my own dough but since I was tired and hungry all I could think was the convenience would be much easier on me! With all the meat toppings on this pizza I decided that a glass of Gallo Family Vineyards Cabernet Sauvignon would hit the spot and make my meal complete! What are your favorite toppings for pizza and what Gallo Family Vineyards Wine would you pair with it? Are you like Grumpy and love your pizza loaded with pepperoni, sausage, and bacon? Or are you more like me and like to go “gourmet” and try several different kinds of recipes or create your own? Some of my favorites are the Deep Dish Bacon Cheeseburger Deluxe Pizza, Pesto Steak and Arugula Pizza, and a Curried Butternut Squash Naan Pizza! Grumpy’s favorite pizza that I have posted here on my blog is the Sausage, Mushroom, and Onion Deep Dish Pizza! 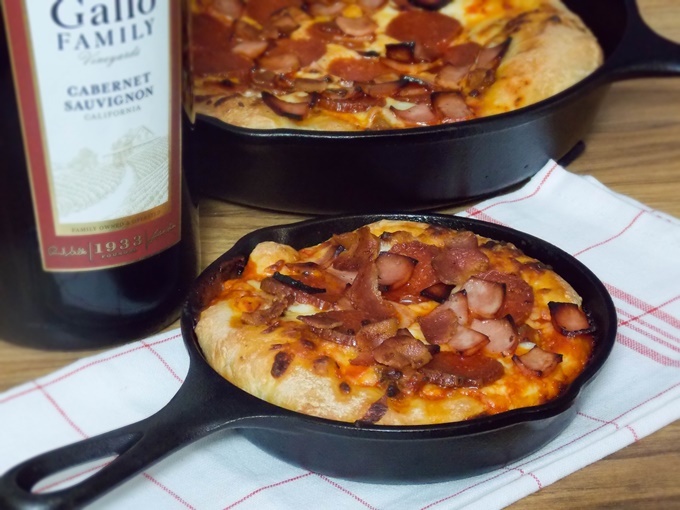 For more great pizza and wine pairing ideas be sure to check out Gallo Family Vineyards blog post! Please note that the ingredient measurements do not have to be precise for your toppings. Put as much or as little as you like, this is only a guideline. However, I found that the amount I have listed here is pretty close to perfect! Pre-heat oven to 400 degrees. Divide Pizza Dough between two 10 inch cast iron skillets, or use a pyrex 9×11 baking dish if you do not have a cast iron skillet. In a mixing bowl, combine the cooked sausage with the marinara sauce, reserving about 1/3 cup of the sauce to put a thin coating over top of the pizza dough. Press the dough out into your skillet that has been coated with a small amount of olive oil. Layer with a thin layer of marinara sauce. Top with cheese, sausage mixture, pepperoni and both Canadian and regular bacon. Bake for 25 minutes or until crust is golden brown. If desired, mix brush crust with 1 tablespoon butter, season with Italian seasoning and garlic powder. Remove pizza from skillet and let rest for 3 to 5 minutes before slicing. This looks SO good! I love deep dish pies, but have never made one at home….I need this pie in my life! Don saw this on Facebook and told me that’s what he wanted for dinner! haha Looks fantastic, Shelby! This is like my husband’s dream pizza! I LOVE my cast iron cookware! You’re right, everything does taste better cooked in cast iron.) But I’ve never tried making pizza in it! I can not wait to try this out! Now that is a man-pleasing pizza!